Continue this pattern 6 times so in the end you will have 6 sections of each color. Fasten off and weave in all ends. 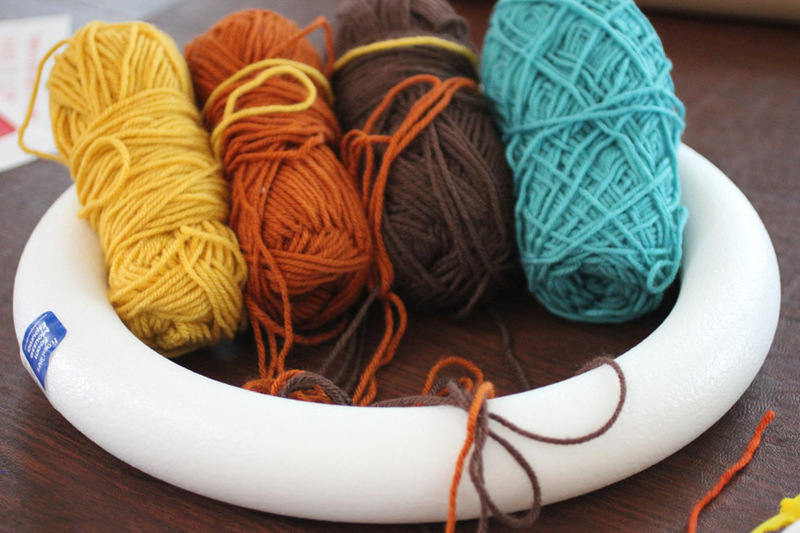 Sew onto your wreath. Just be sure to line up each color to itself. Embellish with my Teeny Tiny Crochet Pumpkins. You can find the pattern HERE. The leaves are a free pattern from Wind Rose Fiber Studio. You can find the pattern HERE. 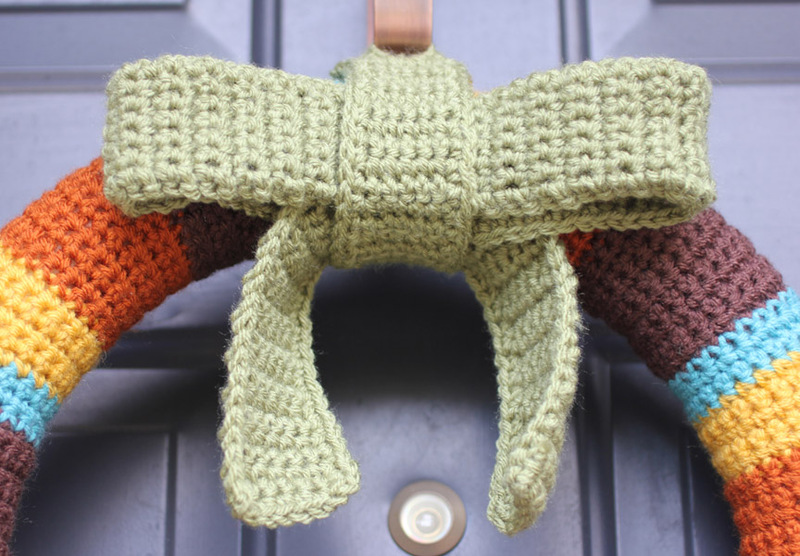 Crochet a series of rows to make a bow or loop to hang wreath with. Mine was 6 SC wide and about 3 ft long. I absolutely LOVE this!!! I featured you on my blog today. I only have 94 followers but I hope they all click over and check out this lovely wreath. Blessings Sarah! Thank you for always inspiring me. this is really pretty! thank you for sharing the how-to for this wonderful autumn project. If it's just a solid rectangle, won't it bunch up in some places? I'm going to make this, so I just wanted to be prepared if that's the case lol. I was afraid of that happening, but it didn't! Just make sure to line up the colors. The yarn stretches and curves nicely with the wreath. That is really so cute! I love the colors and the big bow! Love this. I'm also thinking it would be a nice pattern to change up the colors and decorations for other holidays. I'm thinking a Valentine's day one with red, pink, and white colors and some hearts. Great idea Sandra! I would love to see it if you end up making it for Valentine's Day! I love this! And love that pop of blue you added … very nice! Love it. May I ask how you tied the bow at the top. It looks beautiful. I love the colors you choose to use. I don't think it's tied at all. just different lengths of crocheted strips folded in half. A short strip was folded in half vertically and secured at the top of the bow. A second longer strip folded in half and slid horizontally into the loop, then a strip slid in behind the horizontal loop. Hope I made sense to you. Yes! That is mostly correct! The bow is just one long strip folded into two loops and then a shorter strip around the middle of the bow to secure it around the wreath. This is great! Could you tell me what yarn brand you used for this? 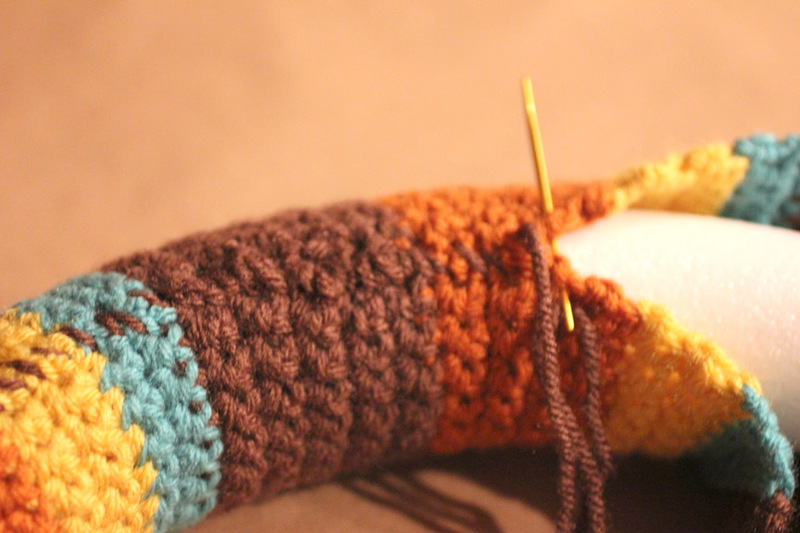 I used Vanna's Choice yarn for the orange, yellow and brown and Loops and Threads Impeccable yarn for the turquoise. Wow! Absolutely gorgeous! Great work. I love this wreath! I love the colors! This is gorgeous! I love the pumpkin vignette with the leaves. Were you inspired by the summer wreath that was featured at Hookin On Hump Day a few weeks ago? It was gorgeous, too. I'm gonna make one like this! 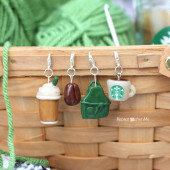 sooooo cute!very very cute… I love to crochet. 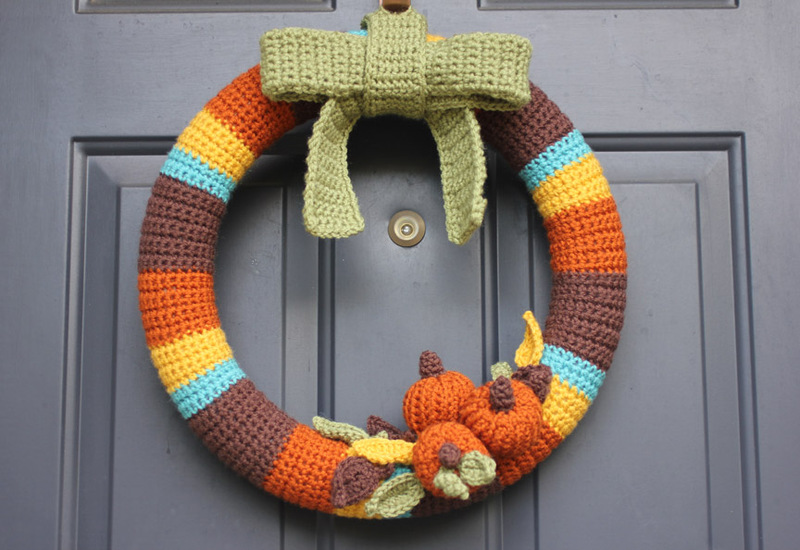 I'm a;lmost tempted by this one, even though we don't really do wreaths here in the UK. I'll be pinning it in case! I love the pattern! I just bought a new house and wanted to put something classy out on my front door for my favorite season. This will be put in the works soon! 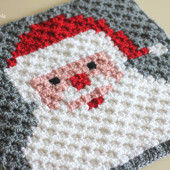 Did you use Vanna's Choice yarn? Could you tell me the names of the colors & brand? I really love what you used & would love to make my own. Thank you. Yes, I used Vanna's Choice yarn for the orange (Rust or it might of been Terracotta…sorry I am not sure but both would look nice), yellow (Mustard) and brown (Chocolate) and the Turquoise is Loops & Threads™ Impeccable™ Yarn in Aqua. Hope this helps! That is the most adorable wreath I've seen! Great job!!! Very cute- I'll be featuring this on Thursday!! This is so so SO adorable! I love it! Thanks so much for sharing at Shine on Fridays! I love the colors, the pumpkins…aahhh! Thanks Paula! I couldn't figure out where to link up but maybe that is because I am late to the party. Thanks for the invite!! This is so pretty! I love it. I really admire you for having patience to crochet, I wish I could learn. 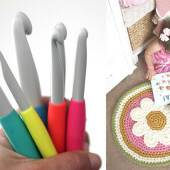 Oh I wish I knew how to crochet because this is adorable!!!! Amazing job! Thanks so much for sharing on craft schooling Sunday! This is beautiful! I've only crocheted when my mother in law has been visiting so she was by my side ready to help me when I messed up but I think I am going to try your wreath out and see how I do. Thanks for such a pretty idea! Your wreath is gorgeous! I'm in love with the colors and the little pumpkins! Thank you for sharing at our Pinteresting Party! Just completed mine! Thank you for the great pattern! I love how it looks on my front door. I just finished this wreath. Thanks for the pattern! PS – was the foam wreath supposed to be a 12" (not 16") foam wreath instead? I bought a 12" wreath by accident and found that my striped wreath cover fit perfectly, and I was glad that I didn't buy the 16" wreath. I have no idea how to crochet but I just knitted the main striped 'scarf' and am working on the bow, but I need help with the pumpkins- I don't know how to knit little pieces like that. Thanks for sharing! This is beautiful! It's a bit late for Fall for me, so I might try it with Christmasy colors. What would you suggest to add as embellishments? You are SO creative! I love it…! <3 Fall is my favorite season. (I'm originally from Connecticut – that may be why) I love the warm colors, and the fall traditions. This is beautiful… maybe I'm going to try this for next year! Thank you so much for sharing! 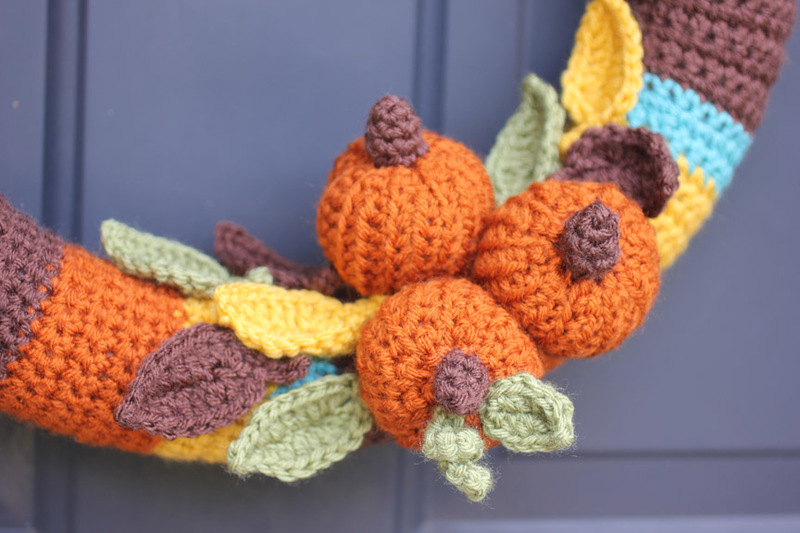 My girls and I are going to make this wreath for Fall…how did you attach the leaves and the pumpkins? How did you attach the strip to the wreath hanger on the door? I didn't want to do the bow but can't think of a good way to hang it on the wreath hanger. Thanks! Is there a knitted version of this cute wreath? What's the color of the yarn used for the bow/leaves? Absolutely love this. Working on it now… any tips for how to tie the bow? I can't seem to get it right for the life of me!! Thanks! 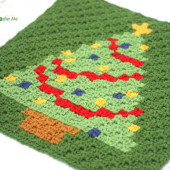 Love this pattern and am going to do one up for Christmas. How did you hang the wreath/bow from a door hanger?? Thanks!! Gonig to try one for Christmas. Love this idea. You can make so many ones for different holidays. Can't wait to make my first one. Thanks for keeping it simple. When you get to the end of the row do you have to go into the chain? my edges are becoming uneven at every other row. I bought a 12 inch foam wreath. Will this change the pattern at all? I am killing myself trying to tie the bow. How did you tie it like that? Thanks!! 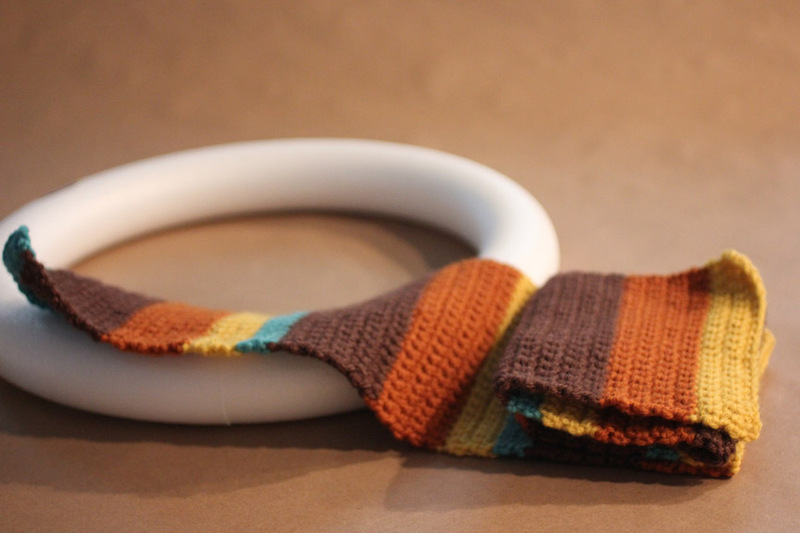 Can someone please post crochet directions for the bow? 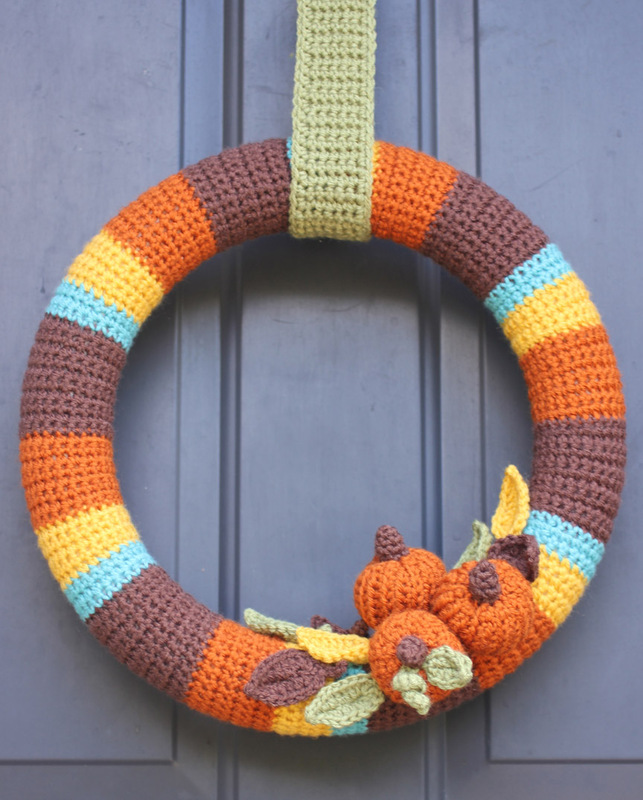 I don’t know how to make it and I love this fall wreath. The bow really sets it off! THANK YOU!! 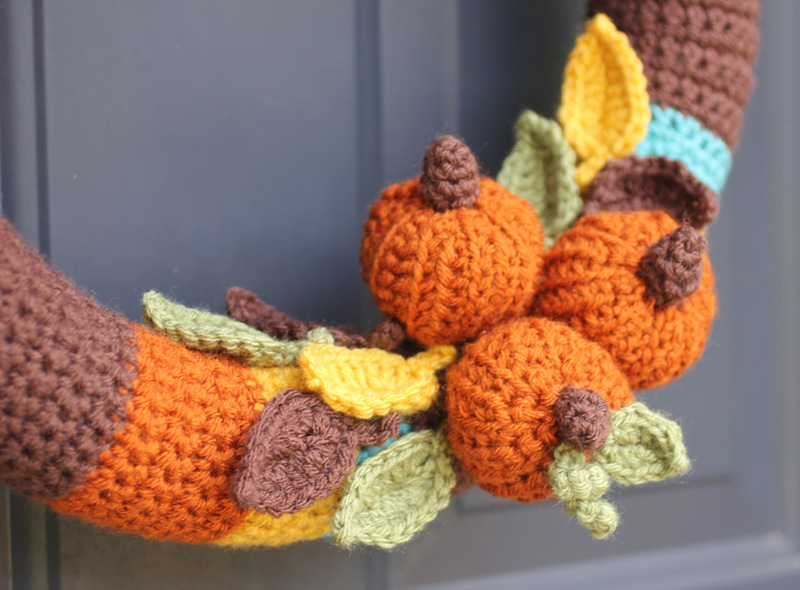 How did you attach the pumpkins and leaves? Thanks! Hi. Love the pattern, thank you for sharing it. 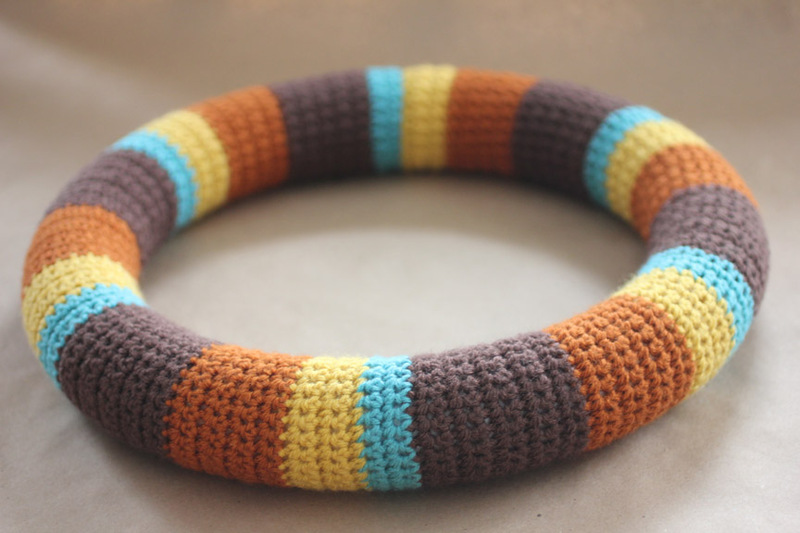 I’m currently crocheting this & it seems it isn’t fitting the 16″ foam ring. I’m using an H 5mm hook, I don’t know what I could be doing wrong. I’ve tried stretching it as far as I can, no go. Any suggestions? Going up 1 or 2 hook sizes?